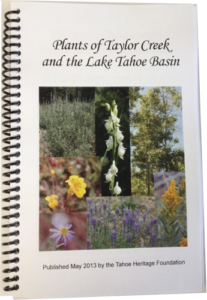 Over the years the staff at the Taylor Creek Visitor Center created a notebook of local wildflowers that is used to answer visitor questions by the USFS staff and THF volunteers. Visitors regularly asked for copies of pages…or of the whole document. In 2011 the staff began to digitize the notebook. In 2012 Tahoe Heritage Foundation took on the project, formatted and edited the material and in may 2013 published the document for sale at the Tahoe Heritage Foundation shops. It sells for $14.95.